You have reached HarperCollins What Is the World Made Of? : All About Solids, Liquids, and Gases (Let's-Read-and-Find-Out Science 2) in Findsimilar! Our expertise is to show you Paperback items that are similar to the one you've searched. Amongst them you can find Change It! 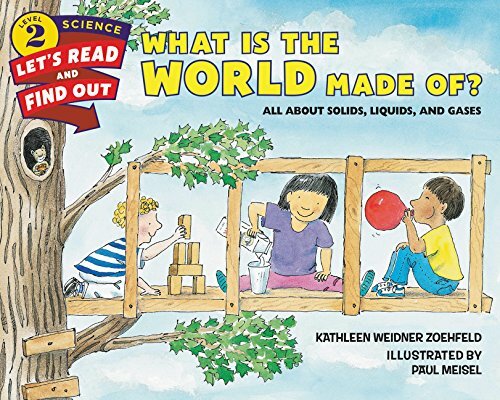 : Solids, Liquids, Gases and You (Primary Physical Science), Solids, Liquids, And Gases (Rookie Read-About Science), What's the Matter in Mr. Whiskers' Room?, Matter: Physical Science for Kids (Picture Book Science), What Is a Solid? (First Step Nonfiction ― States of Matter), What Is a Gas? (First Step Nonfiction ― States of Matter), What Is a Liquid? (First Step Nonfiction ― States of Matter), Forces Make Things Move (Let's-Read-and-Find-Out Science 2), What Is Matter? (Rookie Read-About Science), Joe-Joe the Wizard Brews Up Solids, Liquids, and Gases (In the Science Lab), all for sale with the cheapest prices in the web.